Welcome to the book study for Chapter 2 of Mindsets in the Classroom written by Mary Cay Ricci. This book study is being hosted by the lovely gals over at Hello Sunshine Teachers. Isn't their blog button the cutest? What Are Some Ways To Begin Building a Growth Mindset School Culture? 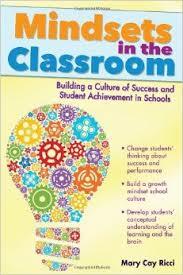 Seven steps are highlighted in this chapter so schools can begin transforming their culture to one of a Growth Mindset. This step details the first professional development meeting with staff. In order to find out what staff currently believes, teachers are given an opportunity to write down their beliefs on intelligence. The chapter provides an example of a teacher worksheet to use however you can get free, ready to print ones at Hello Sunshine's Chapter 2 blog post. First of all I must define the word "malleability". To be embarrassingly honest, I had never heard of this word before reading this book therefore this definition is more for myself than anyone reading this. According to Merriam-Webster online "malleable" is defined as "capable of being easily changed or influenced". Synonyms include "moldable" and "shapeable". I can't even tell you how many times I clicked the audio pronunciation button for the word "malleability". Try saying that word three times fast! "We can all get smart at Harmony Park"
"Our effort is the best at Havencrest". I started thinking about my school's motto. "Be a STAR. Success is Your Only Option." Would someone view this as a growth mindset or a fixed mindset motto? It seem positive enough but for some reason I keep getting hung up on the word "only". I feel like it needs more key words. I'm going to have to think about that one! I know I have said "Great Job" to my students many times over the course of the school year. This step reminded me that I can change my praise to a growth mindset praise by simply modifying or adding effort praise. The example given in the book is "You did a great job on that paper" but adding "I can tell you worked very hard". While this is something that is not new, I recognize that I need to do 100% of the time! This step acknowledges that the field of neuroscience is an ever changing field when it comes to studies and research however one thing remains the same. Neurons make new connections, those connections become stronger with practice and effort. These lessons cannot be just a few lessons. As I think about the curriculum at my school I can say that the brain is covered during a unit called My Five Senses. This unit last for 2 weeks. After reading this step I understand that I need to remind my students often about the brain and that their intelligence is influenced by their their effort, persistence and motivation. These are words that I will be using much more in my classroom. I communicate with my student's parents through a weekly newsletter. One thing that I will do differently is give growth mindset tips each week. This book provides several good examples of how to praise our children in Appendix B with Parent Newsletter "Blurbs" in both English and Spanish. Then there's the Welcome Letter that provides another opportunity to let parents know my belief system. Definitely have things to add to my To-Do List! Chapter 3 begins Tuesday June 9th. Important to a Growth Mindset Culture. "My brain is getting smarter and smarter each day." I'd love to have my kinder kids say this! Great reflections on the chapter! 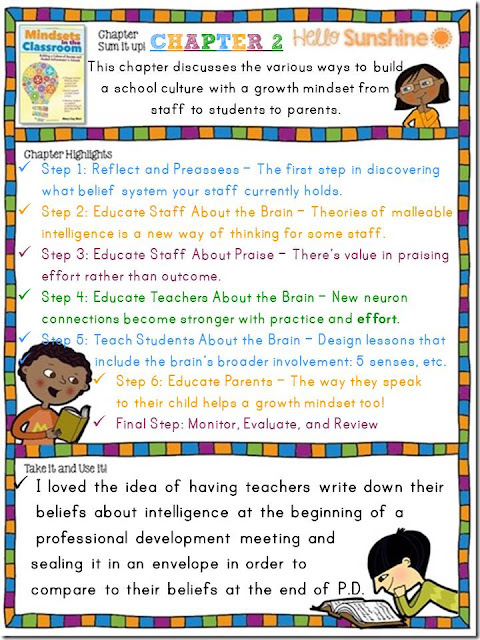 I love the idea of having your kinders say the sentence from the beginning of the next chapter: "My brain is getting smarter and smarter each day." I agree that we all need to work more on talking about the effort that a student puts forth! We also need to make sure that if they aren't putting forth effort and they are still getting the right answers that we find a way to help them dive deeper! Thanks for linking up with us!! I loved the topics in this chapter! I make such a big deal of effort in my classroom. And I can't get enough of the idea of a motto. Your idea of saying the opening quote from Chapter 3 inspired me to have my class create a classroom motto and we say it together each day, too! Your blog is perfect. Maybe you haven't given it much in thought, that the most profitable thing is to hire a first class editor from www.essaykings.me. No doubt you'll get more visitors.